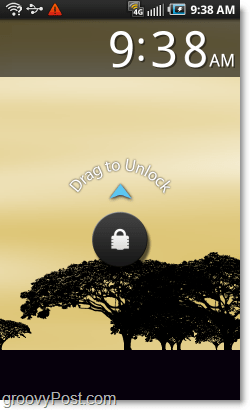 If you set up a Pattern Lock on your Android device, then you’ll know why we wrote this how-to. The Android operating system doesn’t have a timeout attached to the pattern lock feature, this means that every time your screen turns off your phone will become instantly locked. This becomes so annoying that most people will opt to not even use the Pattern lock. Let’s fix it the easy way, with a free app! 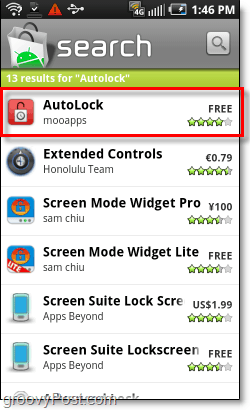 Update: It looks like as of 9/13/2010 for some unknown reason Autolock is no longer on the Android Market. I’ve uploaded a copy of the app for download to a mirror in the mean time. Normally you have to battle with the pattern lock as soon as you enable it. If you even sleep the phone with the screen off for half a second the lock pattern will be there waiting for you. 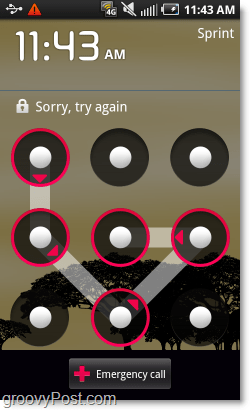 With this app rather than having to solve your pattern puzzle, all you will have to do is slide up to unlock like you would if you didn’t have a pattern lock set. But you can still keep your pattern lock set up so that if you do “lose” your phone your files will be protected. 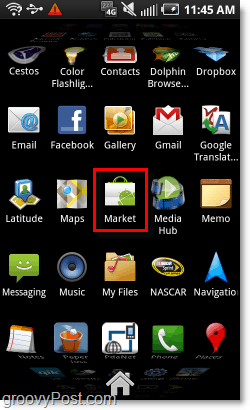 On your Android phone, access the App Drawer and Tap the Market app to open it. 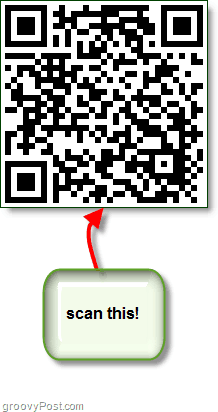 Optional Shortcut: if you have a QR code scanner you can just launch that and point your phone’s camera at the the code on this screen to automatically go to this app in the Market. If you do this just skip to step 4. 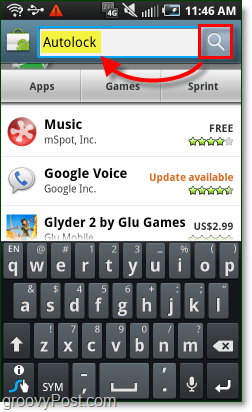 In the Android Market Tap the Search icon and Type in Autolock, then Tap Search again. Download and Install the AutoLock app, made by mooapps. The app is free, but if you like it they also have a donation version so you can toss them a few bucks for their hard work. 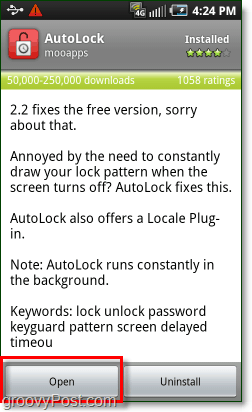 Once you finish installing AutoLock, Open the App. Make sure that the AutoLock line has a green check, that means the app is enabled. Once that is done Tap Automatic lock delay. 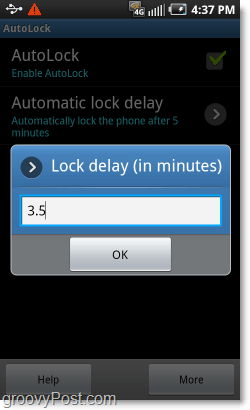 From the Automatic lock delay list that appears, Select an amount of time you would like your Android phone to wait before pattern locking the screen. For me, 5 minutes works great. 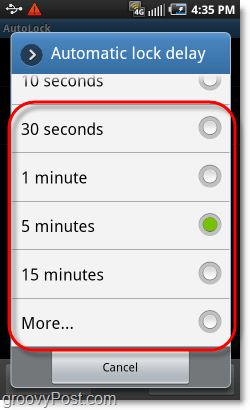 You can also set a custom time if you Select More…. Now your phone will wait the amount of time you specified before requiring you to use the pattern lock. 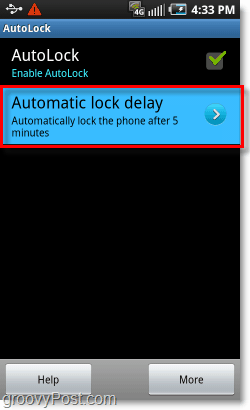 The lock delay time will not begin until your screen turns off or you sleep the phone by pressing the power button. This is a groovy way to save time and frustration, while still keeping your phone secure! Instead of being required to keep your screen on, you can save on battery by turning off your screen and then coming back in without solving a puzzle. It works a lot like the iPhone does, all you have to do is slide the lock icon up if you are within the delay time limit. Looks like you installed LauncherPro. And I did too, and after getting the lockpatern done, everything went wrong. LauncherPro isnt fast enough to handle an incoming call and at the same time take care of the lock patern. I went terrible wrong for me more then a few times. So I disabled the lockpatern. And after that everything went great again. Ouch, yeah LauncherPro is a nice UI but it does still need a bit of work. The main thing is you don’t have to root the phone! I may switch over to TouchWiz once Samsung makes 3.0 available on the Epic 4g. Just did some additional testing of LauncherPro, you can read my post on it in the forum. But yeah, LauncherPro is a pretty big system hog it seems. I mean it’s a great UI but I think it takes up way too many resources for what it does.